Wele to Laksh Finechem Private Limited. Manufacturer and Exporter of Pharmaceutical Chemicals. An ISO 9001 2008 certified pany, established in 2009 at Anand. Our Rigorous quality checks and hygienic environment make us different from others. SLN Pharmachem and CIPLA Limited are some of our esteemed clients and we are backed by effective stable positions and qualitative packaging facilities. We present a unique range of Iodine Derivatives, Chiral Resolving Agents and Sanitizing Groups. Our Iodine Salt and Iodine Derivatives are widely appreciated in the market. Chiral Resolving Agents offered by us are best in the industry amongst others. Sebacate, Stearate and Adipate Groups are available with us at cost effective prices. We also provide Succinate and Sanitizing Groups that are available at industry leading prices. Along with that we offer Octanoate and Nickel Groups that are a class apart. To Get More Information, Log On At www. 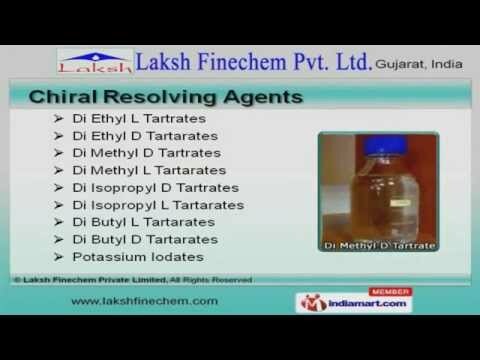 Laksh Fine Chem.